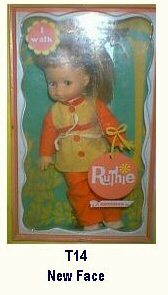 In 1967 Ruthie got a new face. 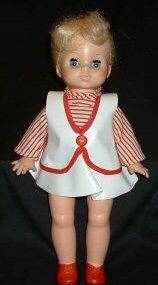 She was marketed under the name Ruthie, but the same essential doll was marketed from 1967 thru 1969 under a lot of girl names with different "look" made of change of hairstyle, hair color, outfit. 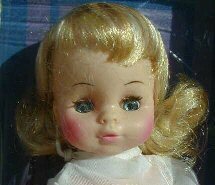 same bodies as BlowVinyl II Ruthie Girls but classic Ruthie face was redesigned for a more "poutier" look. Most common size was 13-14".